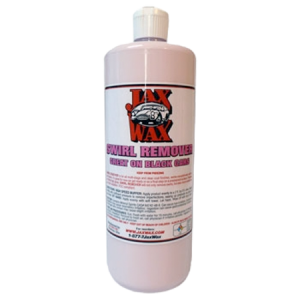 Jax Wax Cherry Wax is a pink-colored premium-grade carnauba liquid wax, containing detergent-resistant polymers for long-lasting durability. Jax Wax Cherry Wax gives an extreme “wet look”, and is cherry scented. Jax Wax Cherry Wax Leaves a showroom finish on new or older paint with an incredible reflection, bringing out the true richness of the color on your finish. 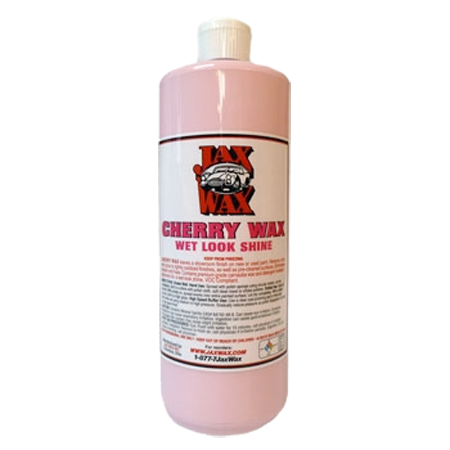 Jax Wax Cherry Wax is Easy to Apply and Easy to Wipe Off. It also will eliminate streaks and haze that other waxes leave behind. Jax Wax Cherry Wax leaves that wet-look with a hard protective coating and a mirror-like finish. Whether your vehicle is a driver, or a classic car worth thousands – Jax Wax Cherry Wax can make a novice look like a pro. 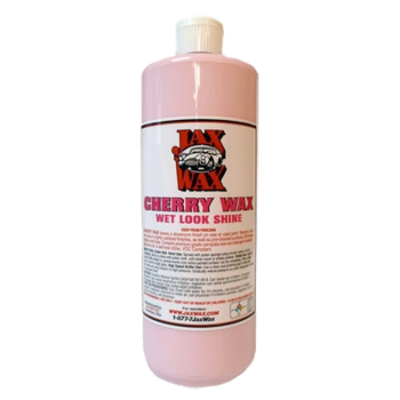 Jax Wax Cherry Wax is extremely easy to apply and remove by hand, and can also be used with an orbital or high speed buffer if desired. Other than long-lasting protection, Jax Wax Cherry Wax will also help cover micro-scratches. 1. For best results – start with a clean surface – wash it first! The better surface you start with the better the finish will look. We suggest using Jax Wax Wash N Wax or Jax Wax Super Suds. 2. Shake well before using and occasionally during application. 3. Use a Wax Applicator to apply the product in thin even layers. Thin is In! Think of it like painting a wall – a couple of thin even applications of wax is better. Don't apply wax like most people that use laundry detergent and think more is better. You not are adding anymore protection, durability or shine by using more wax. By applying the wax thin, you also avoid caking it in the body seams and are not wasting precious product. No need to use circular wiping motions! Just wipe it on in straight lines, slightly overlapping each time. From our experience, a good Wax Applicator makes all the difference in applying the product in thin even layers, is inexpensive and is worth it's weight in gold! 4. Do the entire vehicle at once. Don't be scared. The wax comes off so easy without streaking, smearing, hazing or dust, it is not necessary to do sections at a time. 5. Wax your windshield, glass, mirrors and chrome. The product works similar to rain repellent. It will not streak on the windshield with the wipers on, even at night. In fact, you won;t have to use your wipers as much and the water will be right off. 6. After the wax dries, wipe it off with a Microfiber Towel and reveal a brilliant finish! We suggest using a Microfiber Towel as it will make the job easier and reduces the chances of scratching the surface. Turn your Microfiber Towel over frequently. The wax comes off very easy. No need to use pressure or rub the finish, let the Microfiber Towel do the work. Excessive rubbing and pressure even with a Microfiber Towel can cause swirl marks. Be the first to review “Jax Wax Cherry Wax” Click here to cancel reply.